You just missed a section! If you want to see the part of this document that examines map design (dungeons and towns) you can check out the print and eBook versions. This section deals with the interplay of music and design. Unlike the other sections, which examined the impact of story on the design of the game, this section examines the reverse—the effects of design on music. Many of the various design and development trends which began in FF4 culminate in FF7, and the musical trends are no exception. 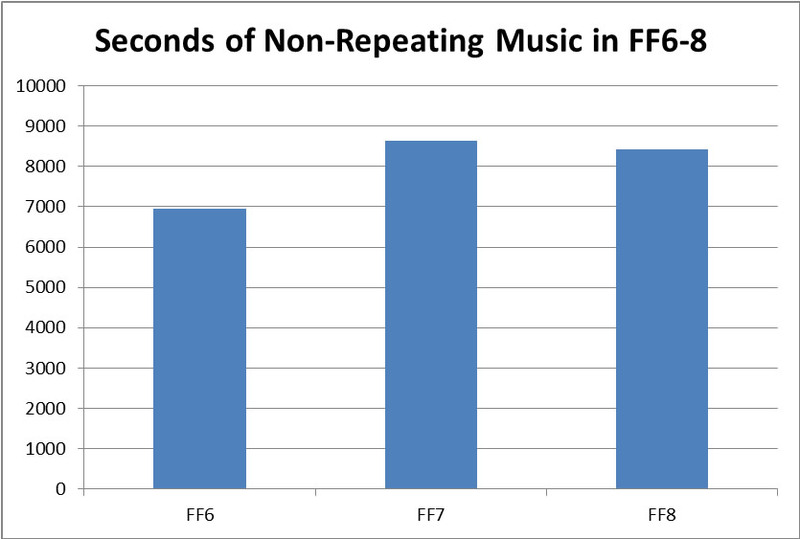 Qualitatively speaking, FF7 is the peak of Nobuo Uematsu’s second period, which began in FF4 and ended in FF9. There are a few primary characteristics of this period. The first characteristic is the prevalence of wind and string instruments playing lines which would be more appropriate as the bass-line of a piece of piano music. Alberti basses and slow, hammering triads played as tutti sections by the winds are two of the more frequent techniques in this style. There are some good examples of this in the FF7 main theme. At 1:58 in the theme, the clarinet is playing an Alberti bass while the piano is playing the melody. At 4:22 the middle strings and low brass instruments plunk out three-tone quarter notes that would fit easily and obviously under the fingers of the left hand on a keyboard. I don’t want to too spend too much time on Uematsu’s highly idiosyncratic orchestration techniques, because that could easily end up as a whole book unto itself. Also, such a topic doesn’t really relate to the design of the game in any meaningful way. Other characteristics of his second period are clearly influenced by the structure of the games he wrote for—especially FF7—and so they make for a better topic in this section. The other two big characteristics of his style in this period are a heavy use of leitmotif and an idiosyncratic type of introduction whose use he greatly expanded in FF7. Those two features make for a good leaping-off point for discussing FF7’s music, especially compared to other games in the series. One thing I have tried to do in this section is to analyze the quantitative aspects of the soundtrack that traditional music theory does not necessarily cover. The foremost reason for doing this is that such an analysis can help game developers who know little or nothing about music. This doesn’t mean that such an analysis is simple. For example, to find out how long the soundtrack is in seconds, simply adding up the amount of playing time from the soundtrack listings isn’t going to work. Videogame music tends to repeat forever, as long as the player hasn’t changed the conditions of the game by progressing to the next level/zone or activating a power-up with its own unique music. In an album form, this infinite loop tends to only repeat twice fully, then fades out on the third repeat. But when trying to count the composed length of the music without counting the loops, it’s necessary to listen to the track and stop counting at the beginning of the first repeat. The real “raw” amount of composed music for any given game is the number of seconds before the tracks repeat. You can see these raw totals for FFs 6 through 8 below. 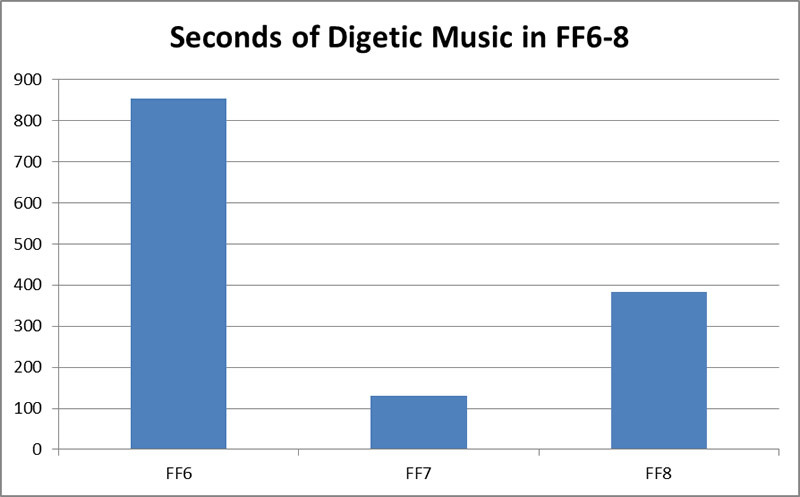 The raw totals speak for themselves; FF7’s OST is the longest, but only by about three and a half minutes. It’s tempting to say this is because FF7 was the game that the original Final Fantasy team worked the hardest on, but it may be coincidence. There are plenty of structural reasons why FF7 might have more music, and we’ll see some of them below. When counting the raw amounts of music, I ran into an interesting phenomenon which isn’t limited to Final Fantasy, but is particularly evident in the work of its composer, Nobuo Uematsu. Many videogame tracks repeat endlessly, but they often begin with a few measures of music that are not included in the repeat. This is actually quite similar to the structure of the way that marching bands play marches. When a marching band plays a march, there are almost always repeats of the various sections of that march, but the first few introductory measures are never repeated. Videogames do the same thing, but probably not for the same reasons. Marches feature a large number of repeats because they are primarily composed for a band marching down a street; because they pass new audience members as they walk, nobody notices the repeats. The intro, meanwhile, serves as a great way to transition from a drum cadence to playing music. The intro gives inattentive band members a chance to figure out what march the band is playing and come in on the first measure of the repeated material. It also tends to catch the audience’s attention. Or, in other words, the repeats and intros solve a lot of practical problems for marching bands, and so their use is preserved in the literature even when bands aren’t marching. Introductions and repeats exist in videogames exist for analogous reasons. The reason for repeating music is obvious; the game disc or cartridge can only hold so much music, so it has to repeat. The original reason for march-like introductions in game music was probably to inform the player that a game had loaded on an old arcade machine. Although there would obviously be action on the screen, players engaged in marathon sessions or who had bent down to put quarters in the cabinet might have a moment’s inattention that cost them character lives and/or money. As a part of good UI design, the music can alert the player that a game is starting up. Home console games preserved this feature. 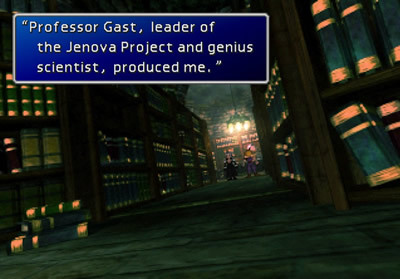 The reason this is relevant to FF7 is that Uematsu was presented with a problem that he had to solve with music. 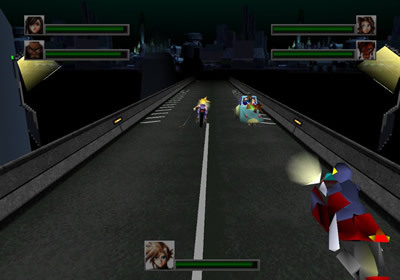 Starting in FF7, Squaresoft began to use elaborate, lengthy cinema scenes that were sometimes integrated directly into gameplay without a significant pause or break. The cinema scenes, obviously, had to have music. By convention, the section of gameplay after the cinema scene had to have music, too, and that music had to loop. In order to achieve the same kind of seamlessness that achieved between cinema and gameplay, Uematsu had to musically blend the portions of music which played behind those two things. A good example is the track played over the escape from Shinra HQ. 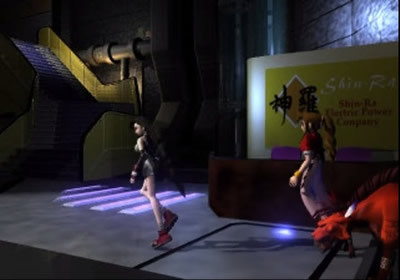 During the cinematic depicting the breakout from the Shinra building, the first 28 seconds of the music are dynamically quieter, and feature fewer instruments. Then, during the actual chase, the music intensifies and stays at a higher level for the whole endless loop. This longer, tailored intro is what I like to call an “Uematsu intro,” because he pioneered their use in longer and more complex situations. I’m not actually covering all intros in videogames with this term, nor am I even saying that every transition into every loop in FF7 is an Uematsu intro. An Uematsu intro has two specific characteristics which separate it from other intros. The first characteristic is that the introductory section must be in the same key signature, in the same time signature and at the same tempo as the rest of the piece. Or, at least, it should have two out of those three. Right here we know that the first music to play during a new game, “Opening – Bombing Mission,” is actually two pieces. Everything up to the point where the track starts looping (around 73 seconds) is in a different time signature and tempo. This is probably why that track has two titles (even in Japanese); it’s really two pieces, although they blend nicely. By contrast the first non-looping 20 seconds of “Holding Thoughts in My Heart” are in the same tempo and time signature as the rest of the piece, and really are an Uematsu intro. The second characteristic of an Uematsu intro is a change in dynamics and/or instrumentation. After the intro plays, the looping section tends to be either significantly louder with more instruments, or softer with fewer instruments. A good example of this change is the synth voices from “Those Chosen by the Planet.” The piece starts with just a tubular bell, low piano keys and a bass drum. At about 18 seconds into the piece, the synth voices come in and alternate phrases with low synth strings. And it’s clear that Uematsu was completely conscious of this strategy, too. 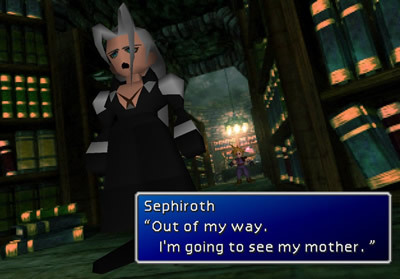 During the flashback conversation with Sephiroth in the basement of the Shinra Mansion, this effect is demonstrated to great effect. As Cloud speaks to Sephiroth, only the Uematsu intro plays. After Sephiroth leaves the basement, the synth voices and strings come in suddenly. There are many examples in the game of Uematsu employing a similar structure to enhance or reduce the emotional intensity of what’s occurring on screen. Uematsu had constraints to work with, but like all the great artists who work on games, he used constraints to produce something amazing. The reason I point out the Uematsu intro at all is that there’s actually a trend in its usage across FF6, FF7 and FF8 that shows how Uematsu had to re-think the use and length of this kind of intro when dealing with cinema scenes. Final Fantasy 6 actually features more Uematsu intros than either FF7 or FF8, but they’re only about three to six seconds long in that game. Uematsu only starts using intros of more than 20 seconds in FF7, probably because of the cinema scenes. It seems that, because he is dealing with a new length requirement, he actually uses fewer of them in FF7 than he does in either FF6 or FF8. That changes in FF8; some of the intros in that game are more than a minute long—longer than some entire FF6 tracks! The reason behind this is almost certainly that cinema scenes keep getting longer across those games. 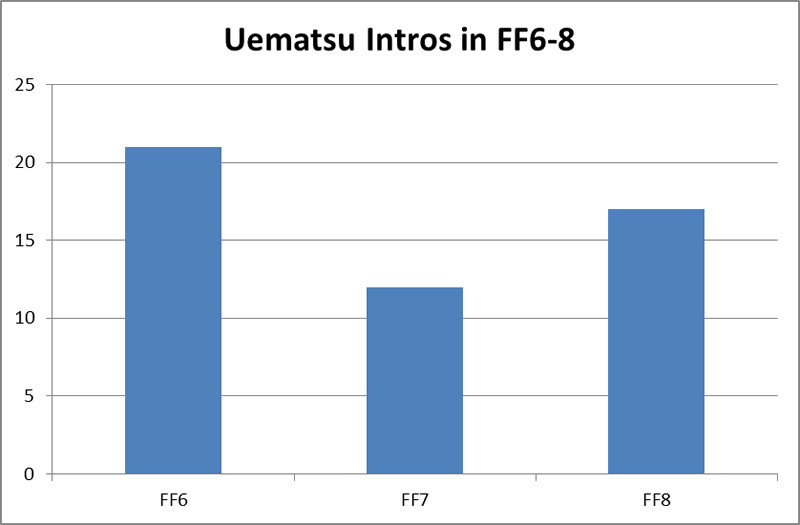 In FF9, the number and length of Uematsu intros actually drops off quite a bit. Whether that is because the use of cinema scenes changed in FF9, or because Uematsu was about to enter a new stylistic period is a problem for different book. 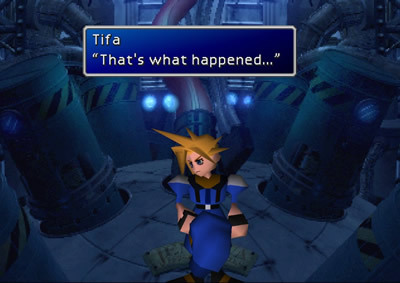 Uematsu’s use of leitmotif in his second period is one of the ways he was able to turn extremely short musical pieces into meaningful comments upon the plot and characters of the games in which they appear. Final Fantasy 6 has quite a bit of leitmotif in it, and because that game is focused primarily on its fourteen characters rather than a main plot, Uematsu uses leitmotif to show us sides of those characters which aren’t always obvious. (You can read more about this in Reverse Design: FF6.) In FF7, Uematsu works leitmotifs into quite a few tracks, most notably the large fifth-interval jump from the main theme. 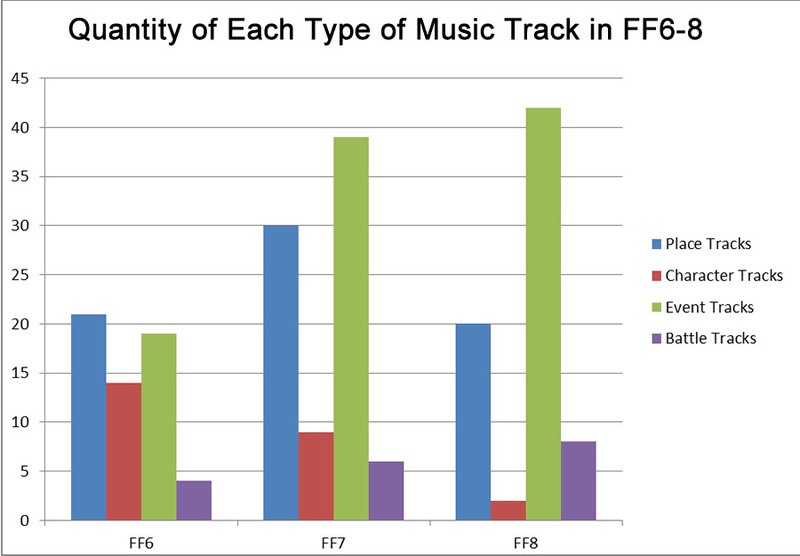 Final Fantasy 7 has more leitmotif than either FF6 or FF8. Final Fantasy 8’s drop-off in use of leitmotif is somewhat peculiar, as it represents a total reversal in a strong trend. The use of leitmotif had only really begun in FF4, and only become widespread for the first time in FF6. 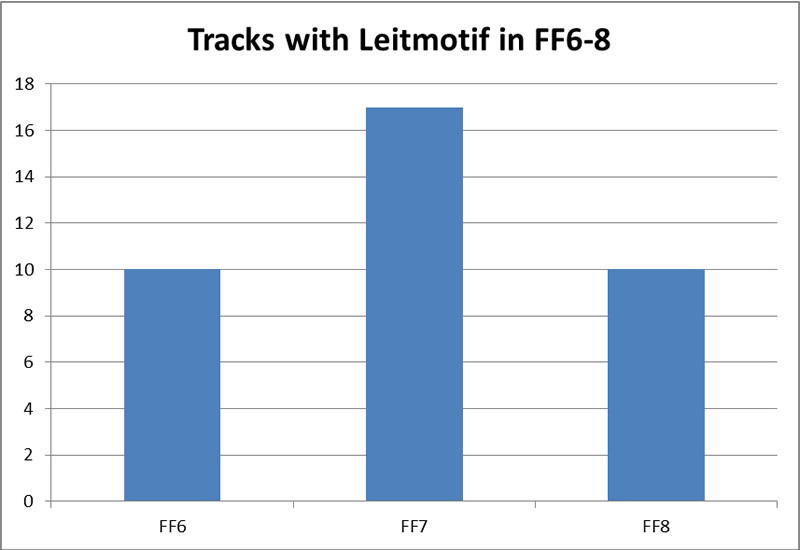 In FF7, leitmotif is present in almost half the game’s tracks. As such, it’s unclear why Uematsu backed away from it in FF8, considering how artfully he’d done it in his past two games. I don’t want to psychologize Uematsu—because he’s probably much more intelligent than I am, and certainly a better artist—but there is an explanation I can make that comes out of music theory. The main theme of FF7, which was the most prevalent leitmotif used, is very musically distinct. The motive in question is a succession of three notes in scale order, followed by a jump of a perfect fifth to the leading tone of the scale. Jumps in melody spanning the interval of a perfect fifth are unremarkable in diatonic music. Jumps from the third note of the scale to its leading tone are not nearly as common as those fifth-intervals to or from the dominant or tonic notes, however. When the listener hears this jump, especially going into that long leading tone, it naturally catches their ear because it of its unusual musical structure. Moreover, the motive only requires one instrument playing it to be recognizable, so Uematsu can sneak it into any track on virtually any instrument. Therefore, it may have simply been easier for Uematsu to work this motive into a large number of tracks in FF7 than in other games. If that’s the case, then the reason for the large amount of leitmotif in FF7 is structural rather than a deliberate artistic decision. The fact that FF7’s OST is still longer while having less digetic music doesn’t necessarily tell us anything about the meaning or artistry of FF7. But I do think that the quantitative difference between the totals tell us the qualitative difference between FF7 and its sibling games. Because the script calls for its inclusion, digetic music must be written, and it often has to be written under strict constraints. In some cases, this turns out wonderfully; Uematsu’s opera in FF6 is one of the all-time great moments in videogame music, and includes possibly the cleverest track ever written for an RPG. Sometimes digetic music in RPGs is a bit less inspired. The music for the concert minigame in Fisherman’s Horizon in FF8 has to be simple to fit the puzzle it belongs to. It also ends up being a little bit bland compared to (for example) the actual location theme for Fisherman’s Horizon, which features some of Uematu’s best keyboard work. To look at the quantitative discrepancies between games another way, we can break the music down by the purpose it serves and see how the games differ. Although the soundtracks for FF6, FF7 and FF8 are all definitely a part of Uematsu’s second period and are stylistically similar, they have some important practical differences. What I mean by this is that one can place each track from a Final Fantasy soundtrack into one of four categories: character music, location music, event music or battle music. Everything is fairly self-explanatory except for event music. Event music plays during unique events, like special music for cinema sequences and their aftermath, or music denoting non-battle successes or failures, etc. Two really interesting trends should be clear here; the first is that the amount of character-specific music drops across each game. The second trend, more pertinent to this book, is in the abundance of location music in FF7. The previous section of this book showed how much time, care and emphasis the design team put into making the setting of FF7 feel persuasive, and the music reflects this focus. I also think that this is a reflection of the main theme of the game. 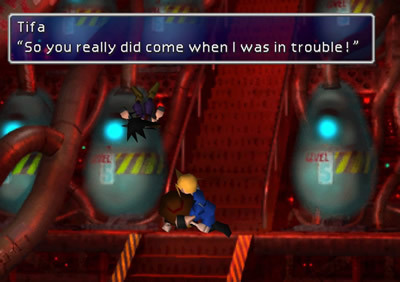 In FF7, most of the major and minor characters (and even many NPCs) are defined by their connection to a place. Thus, the increased number of location themes is also a product of that. I don’t want to entirely neglect qualitative criticism of the music, even if it doesn’t relate to the game design directly. The last important characteristic of Uematsu’s second period is short but narratively dense tracks. This is different from most videogame music, which tries to capture the feeling of a single moment. This is a very practical approach, as it simply reinforces whatever the director/designer was going for in a given scene. Such a style isn’t narrative; it conveys a feeling rather than a story. Uematsu writes plenty of that kind of music too, especially in his location themes. Uematsu also writes themes which encapsulate entire narratives. The best example from the FF6 book was Cyan’s theme, which shows his transition from cold, guarded discipline to vulnerability and, finally, recovery from his grief. That transition takes a dozen or more hours to play out, but Uematsu captures the whole thing in a two-minute theme, and it’s brilliant. Several characters have themes (and reprises) which are very similar to that in FF6, but only one character has anything like that kind of treatment in FF7. Barret’s theme is revisited twice, first as “Mark of a Traitor” and then “Mining Town.” All three pieces are built around the same pattern of three eighth notes, although the mood of each is very different. “Barret’s Theme” is brash, featuring long, major synth-brass chords and a melody that swaggers around the dominant seventh. “Mark of a Traitor” is guarded and hesitant; instead of the major chord progression found in Barret’s theme, the underlying chords pace back and forth chromatically. The same three eighth-note pattern repeats, but in a very staccato pattern on plucked strings, meant to show the humble circumstances of his hometown. And then, finally, “Mining Town” cuts to the heart of the pain and regret that motivate Barret. At 0:58, the ocarina (whistle?) recapitulates the same three-note motive from Barret’s theme, but holds out the last melancholy note each time. The music explains to us that Barret’s brashness is his most obvious quality, and his regret is apparent, too—but the reason he wants to change the world is because of the vulnerable and melancholy heart he hides from the world. It’s amazing to me that Uematsu can wrap up such a penetrating insight about Barret’s character—things which we can see but which Barret is too proud to admit about himself—into such an aesthetically neat package. In a mere three pieces centered on a three-note motive, he shows us all the facets of the character he’s examining. Uematsu doesn’t really use any other character’s theme to tell a story, but the game’s main theme is a great example of narrative encapsulation. At the risk of over-interpreting the piece, I think that each section in the main theme corresponds to a section of the game—and Uematsu uses one particular section in a profound way at the game’s emotional climax. The early section of the theme (about 0:01-0:50) works and reworks the central motive of the piece over and over through various chromatic diminished forms, corresponding to the bleakness of the Midgar landscape. At the 0:51 mark, the central motive makes its first proper, major-key appearance in the strings. The main theme is then developed through the winds, finally culminating in the brass breakthrough at 3:28. This melodic development captures the excitement many of us had as players back in 1997—the feeling that we were exploring a massive and beautifully-rendered world. At 4:00, the main melody is lost completely, and replaced by brooding, accented low brass hits and nervous, dissonant strings. This section corresponds to the increasingly dark revelations about Sephiroth’s plan and Cloud’s self-doubts. This too builds and resolves at 5:17, showing Cloud’s triumph over his profound delusion. Just as Cloud removes his helmet to show that he was really at Nibelheim five years previously, the big brass chords of 5:17 of the main theme play. This echoes the triumphant thrill that many of us felt (he really was there!) when we first saw the scene nearly two decades ago. That scene is the key to understanding the score—it shows us what Uematsu was thinking about when he wrote that part of the main theme. From that moment, I extrapolated the rest of my interpretation of the main theme based on techniques he used previously in FF6. I appreciate that there are many other viable interpretations for the music, and I don’t want to proscribe those. But I do think it would be a shame to overlook one of the best examples of Uematsu’s gift for narrative.